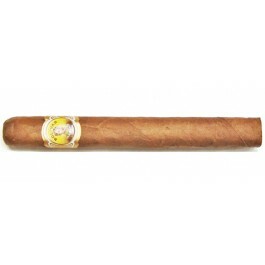 The Bolivar Coronas Extra, discontinued in 2012, is a bold and rich Francisco, 5.6” (143mm) long, of 44 ring gauge, and comes in a 50 cigars cabinet. The Coronas Extra is one of the rare full bodied cigars in the corona register. An excellent connoisseurs' choice after a great lunch. This format is 13 mm. (1/2 mm) longer than the Coronas, and its blend has greater strength. Its format, roll and composition make this Habano the strongest of the Bolivar. Among Coronas, it is comparable to the H. Upmanns and stronger than the Hoyo du Roi from Hoyo de Monterrey.